The royal wedding. Yes, I got sucked in, big time. I will happily admit that I watched every minute of coverage, fell head over heels in love with her dress and at one stage even got a bit teary. Lame, but true. After work on Friday, we headed over to Paddington to stop by the My Heart Wanders book launch at Ariel Books. I love this bookstore and it was great to catch up with a few people but time was a ticking as I needed to be firmly planted near a television, champagne in hand, to watch the wedding hoopla. In keeping with the theme I thought it would be appropriate to head to the London Tavern to watch the ceremony. It was perfect, made me want to develop a posh accent, sip Pimms, travel to London and befriend Pippa and Harry. 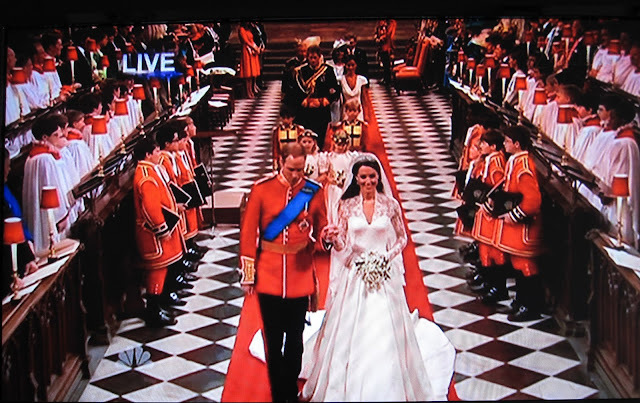 Well my time at the tavern meant that the royal wedding turned into a royal hangover the next day but I didn't mind, it gave me another chance to watch even more wedding coverage, including about 4 million replays of 'the kiss'...gotta love it. I got right into it too! Who could resist? She looked so beautiful and they just seem so in love. I'm such a sucker for romance. That bookstore looks so cute and the London Tavern fiesta sounds fab! I hear you, I got right royally swept up in it myself! Pimms and English muffins ahoy!